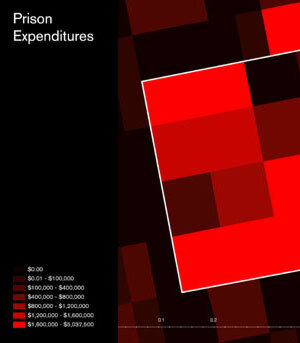 I posted this to McCandless's blog post (http://www.informationisbeautiful.net/2011/great-infographics-no-13/) on Friday and he never moderated it. I guess I was a bit more, well, diplomatic than you were: I’m curious. 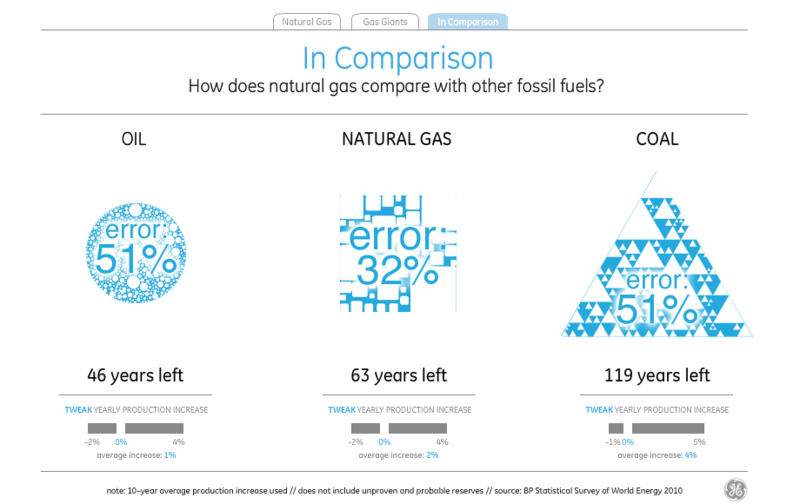 The shapes of oil, natural gas, and coal are beautiful; but what’s up with all the empty space? 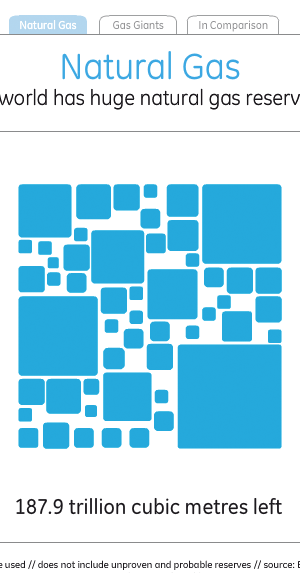 The triangle, the square and the circle (to a lesser degree) aren’t “complete”, and because there’s no way to dissect them it’s impossible to tell what the size of the blue means in relation to the remaining space. 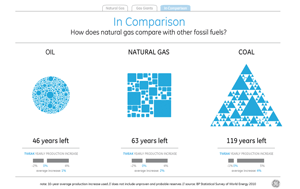 Do the smaller circles and triangles in the other shapes correspond somehow to the portions for individual natural gas producers in the square? I get a vague sense that the squares’ sizes are proportional to production, but there aren’t any numbers to compare so it’s left to the viewer to ponder. The “Gas Giants” tree maps also contain huge gaps, and in the “biggest proven reserves” variation the Russian Federation takes up much more actual space (32%, by my quick calculation) than the 23.7% figure it lists. What’s up with that? Of course, without the data to hand it’s really difficult to determine whether these visualizations are telling an accurate story. Any chance GE would be willing to share it with the world? I took a look at the Gas visualization. 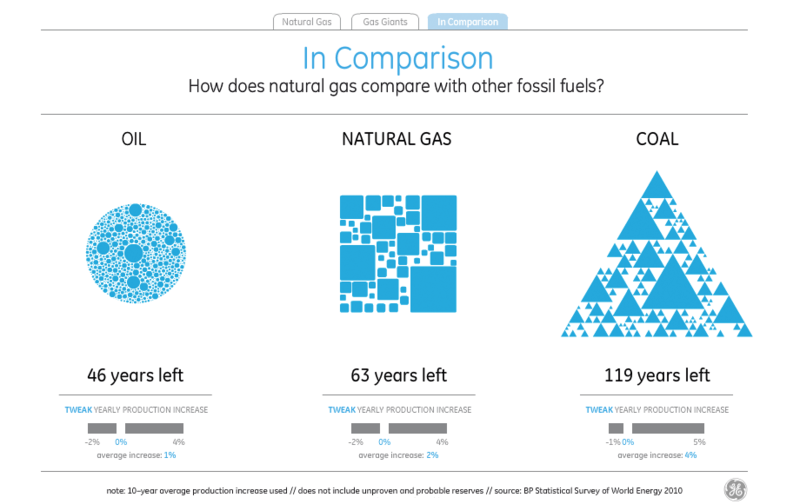 The first thing that stuck out for me was that the natural gas reserves square (as a whole) looked much too small relative to the gas-consumption per year square. 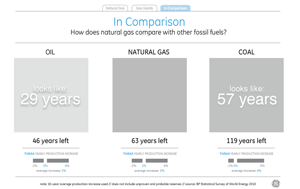 Based on the inforgraphic, it looks like we'll be out of natural gas in 20 or 30 years. But, if you click on "years left", it states "63 years left". So, I took a screenshot of the image, compared the sizes, and (ignoring the gaps between boxes) it appears that the reserves box is 260x260 pixels while the yearly consumption box is 40x40 pixels. Mathematically, that works out to 42 years, not 63 years, and that's assuming all the gaps between boxes are filled in. 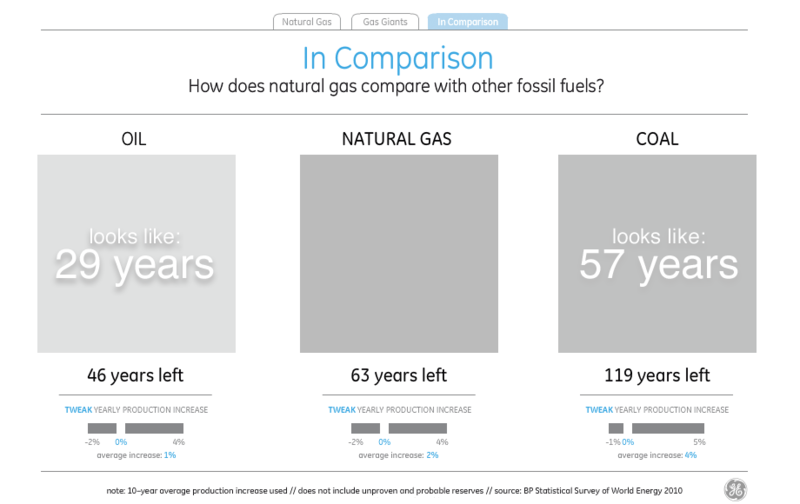 So, visually, it looks like quite a bit less than 42 years of gas is left. 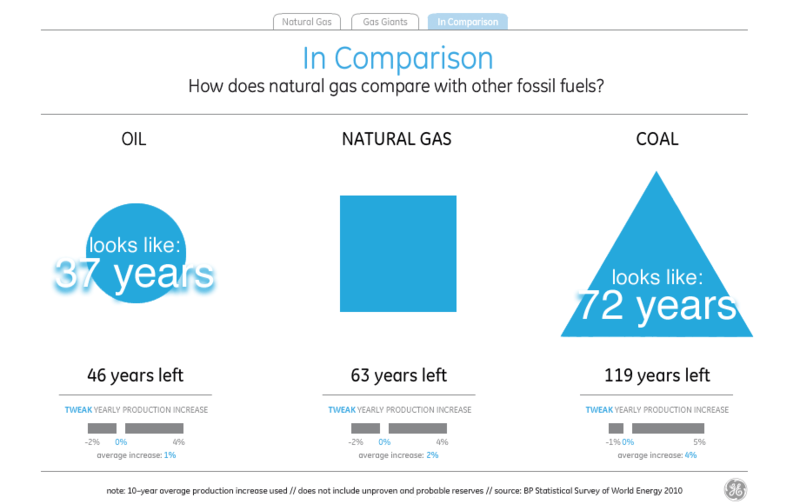 My conclusion: the infographic makes it look like there's a lot less gas than there actually is. 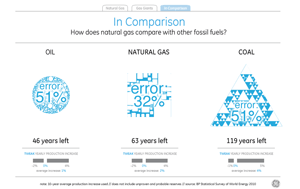 I looked at the gas visualization before finding this blog. I thought the pictures communicated very little except for comparing countries against each other. Is there supposed to be a message in here? 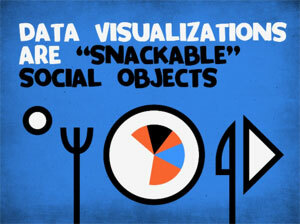 Can't say I care much since the underlying data is already from a biased source. One possibly interesting observation though: Take the comparison chart and adjust the "yearly production increase" slider so that each resource has roughly the same years left... (aim e.g. for 61) you'll see that all the figures have roughly the same height. 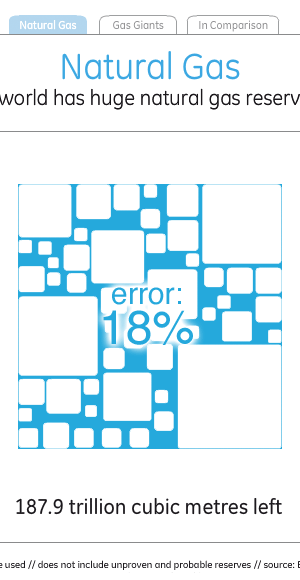 Therefore the scaling here is chosen according to the bounding box, and the amount of "blue" in each picture has nothing to do with anything.